The Scor-Bug is a rotary tool which embosses a row of pearl like little bumps adding texture and relief to your card stock. The reverse side becomes a straight row of little depressions that look like piercing. Simply run the engaged rotary Scor-Bug up the groove of your Scor-Pal over the card stock. Repeat in the next groove and next groove if you wish, without moving the paper, for a side by side linear pattern. The Lattice Grid looks amazing when done with the Scor-Bug. 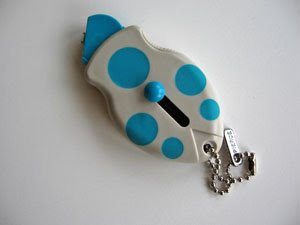 It is color coordinated to match the Scor-Pal, teal and grey and can hang on the Scor-Tote so it is always at hand. $6.95 plus shipping. Please e-mail me if you would like to purchase this fun new tool.